The Committee of NYC Religious and Independent School Officials met on April 12, 2016. The meeting was hosted by Agudath Israel of America and held in the organization’s National Headquarters. Two members of the NYPD made presentations to the participants. 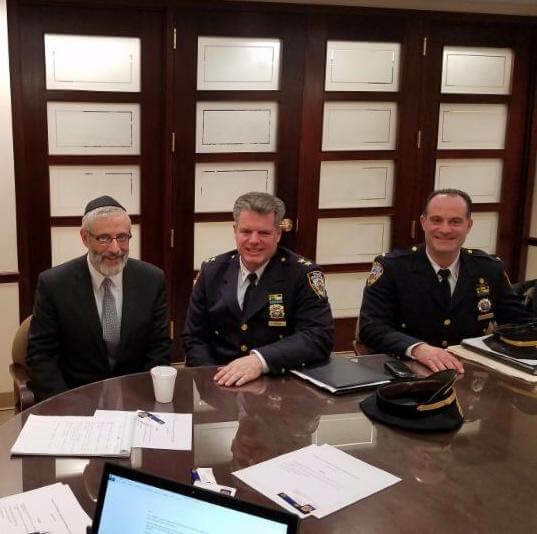 L to R: Rabbi Chaim Dovid Zwiebel, Agudath Israel’s Executive Vice President; Assistant Chief Commanding Officer Brian Conroy, who works at School Safety Division and Lieutenant David Kalin, Counterterrorism/Field Intelligence Unit, who also works at the School Safety Division.